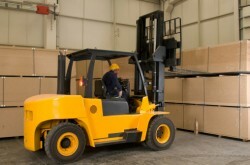 According to the Occupational Safety and Health Administration, forklift accidents killed 90 U.S. workers in 2011. Operator training plays a major role in keeping workers from being injured in forklift accidents. Operating a forklift differs from operating other types of vehicles. While most motor vehicles have four points of suspension, forklifts have only three, which makes them more susceptible to tipping over. OSHA regulations prohibit workers under age 18 from operating forklifts. Forklift operators also must be properly trained and authorized. Workers must be trained not only to operate the forklift but also to perform a complete pre-shift inspection to ensure the safety of the forklift. Very often, however, employers allow workers to operate forklifts without proper training. Lack of communication between forklift operators and other construction workers is a common cause of accidents involving forklifts running over workers who are on foot. Operators should look twice before backing up a forklift, and other workers must steer clear of areas where forklifts are being operated. Operators must also avoid distractions and risky maneuvers, such as taking a forklift up a steep incline.